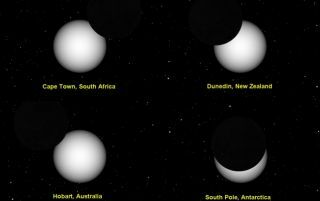 The partial eclipse of Nov. 25 as it will be seen from Cape Town, Dunedin, Hobart, and the South Pole. A partial solar eclipse will be visible from some of the southernmost parts of Earth this Friday (Nov. 25). In a total solar eclipse, the moon completely covers the sun, totally blocking its light and allowing the ghostly glow of its corona to light the area surrounding the eclipsed sun. In a partial solar eclipse, the undiminished light of the uneclipsed portion of the sun shines through and none of the special beauty of a total eclipse is visible. The only thing visible from Earth, to the observer properly equipped with a sun filter, is a greater or lesser notch taken out of the disk of the sun. In Australia, the eclipse will be visible only from Tasmania, with 6 percent of the sun being covered in Hobart. It will be a sunset eclipse in New Zealand, best seen from the South Island, with 31 percent of the sun covered in Dunedin. Looking directly at the sun for even a fraction of a second can do permanent damage to your eyes. Normally, we have an aversion reflex that forces our eyes away from the sun. A partial eclipse like this one is particularly dangerous because the aversion reflex is not as powerful, so there is greater risk for the sun's light burning your eye's retina. There are a couple of completely safe methods for observing the sun: looking through a solar filter or with a pinhole camera. Solar filters, often in the form of "eclipse glasses" are usually widely available prior to an eclipse, and are one of the best ways of observing an eclipse. If you can't find eclipse glasses, go to a professional welding supply store and purchase a #14 welder's glass. This is a denser filter than the #12 that is more widely available in ordinary hardware stores. The #12 does not provide enough protection to view the sun, and eye damage may result. A safer and very inexpensive way of viewing a partial eclipse is with a pinhole camera. Cover a window with a large piece of cardboard with a tiny hole punched in the center. This will cast a dark shadow with a small image of the sun in the center. An alternative, very effective in a classroom, is to place a small mirror on a window ledge, facing the sun. The sun will reflect off the mirror and project its image on the wall or ceiling of the room, where everyone can observe it safely. If you are outdoors, seek the shade of a leafy tree. The gaps between the leaves will create many pinholes, casting multiple images of the eclipsed sun on the ground. While you are observing the eclipsed sun with eclipse glasses or pinhole camera, look also for sunspots on the surface of the sun. Recently there have been some impressive sunspots to be seen. Planetarium software lets you preview what the maximum solar eclipse will look like from your location.